American Buffalo Designs is a manufacturer of items made from American Buffalo. Our products have been conceived and designed by Ruth Huffman, who's passion for the American buffalo makes our products possible using patented processes. After nearly two years of research and development, Ruth took possession of thousands of pounds of rich chocolate brown American buffalo hair. She developed the yarn and brought to life her design concepts by knitting them into elegant capes and wraps giving birth to the American Buffalo Knits Collection. 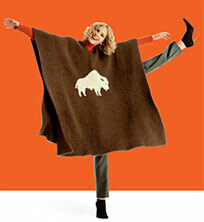 Most buffalo pelts are used for leather, with the hair traditionally wasted. Prior to Ruth's direction, buffalo hair was dissolved or burned off to prepare the hides for sale. What was once a waste product of the buffalo meat business is now the foundation of a new industry. Ruth has pioneered a new industry and her ideas are poised to capture the fashion world's attention. Her luxurious knits spun from the wild, untamed American buffalo are a true tale of beauty and the beast. Please contact us to request our Media Kit.